The government can back off!! If people want to drink raw milk then so be it!! I would be drinking raw milk if I could find it locally. The best I can do in my area is organic. We should be eating food in the form that God made it. Who is man to think that he can “improve upon” what God has made? My father worked in the dairy industry for many years as a plant manager from 1932 to 1976. He would be the first to say that drinking raw milk is risky business. I remember when we’d visit my grandmother’s farm (his own mother) and we’d stop at the little country store to pick up a quart of milk before our arrival. Even though my grandmother had a milk cow, my father would not allow us to drink the milk. Milk needs to be homogenized and pasturized for safety’s sake. To do otherwise is risky business. Sometimes so-called health fanatics take their beliefs to extremes. “Milk needs to be homogenized and pasturized for safety’s sake”. With all due respect, your father was wrong. While pasteurization kills bacteria (both the good and bad ones), homogenization has absolutely nothing to do with safety. It is simply a process that forces the milk through an extremely small tube(s) to reduce the size of milk fat particles so they will stay suspended in the milk instead of forming a layer of cream on top of the milk. Pasteurization is needed for commercially produced milk because it is produced under very unsanitary conditions. If the dairy farmer is vigilant about the health of the herd, the milking process, and testing the milk, etc., pasteurization is not needed. Im with Robin on drinking homogenized, and i admit to never tried raw milk before.With enough things being found unsafe like medications, cars and other things, milk is the last product that i need to worry about. Richard from Leebanons Amish community. Back off government. You can give me warnings, but let me make the final decision. After all after all the US is the land of the free. The FDA has regulations in place for your safety but if one choses to ignore their guidelines, then eat and drink at your own risk. Also, if you do chose to drink this raw milk, I’d be sure that the herd of origin was tested for tuberculosis as well as the cleanliness of the source. This is scary stuff. As for me, I’ll keep with my dairy processed, glass bottle variety. The more the government started regulated what we could eat or drink and what had to be added or removed from those foods and beverages the sicker we as a people are getting. I think it is downright pitiful to allow the government to control our food sources. Now granted I realize some regulations had to be put into effect to prevent shoddy companies from passing off bad food for good, but get real, don’t go overboard with those regulations!!! I wish I could get raw milk here but the few places that sell it in Illinois are too far away, especially with the gas prices now. On a side note,,, we got the phone call today with Frank’s biopsy results,,,,,, NO CANCER!!!! PRAISE THE LORD!! Thanks so much everyone for your prayers. God is so very good!! Ditto on that good news Alice, very good. Ill drink to that myself, except ill be drinking homogenized milk. I’m not a doctor, but i can plug the heck out of a certain blog,lol. I’m not a big fan of government over-regulation either, but one of the few things that the government gets right is food safety as far as I’m concerned. Now if anyone from the government is reading this, my name is Erik, lol. i just watched the news after dinner, and they said a tornado did pass through Lebanon county, along with 2 other county’s close by. No one was hurt so that’s a good thing. And its cooling off quite in a big way here after all that sticky humid weather, we even have frost warnings in effect tonight in Lancaster/Lebanon county’s. So lets sum-up here shall we, i love to promote, Alice is wrong, and I’m very happy about franks great news. Oh and for only this post, my name is Erik……….. signed : You know who from somewhere on the east coast, maybe. Alice … yes, such good news for Frank … God is good! Naomi, as for recent diagnosis of diseases and conditions. They did exist; there were just no names or or discoveries of what they actually were. People didn’t live nearly as long. My own grandmother died of heart disease at the age of 79. Lived her entire life on a farm, ate off the land, used lard, fried everything and yes, she drank raw milk. Sorry, for the most part the FDA is on our side, making sure that what we consume is safe. Those who chose to eat Twinkies, well that’s just not smart. Read the labels and they can see what they are getting. I had a cousin that was very health conscious. She did everything the government way. Would never drink raw milk, ate tons of vegetables, stayed away from things that the “government” said were bad for you. Would not go near smokers never mind having smoking in her home. She was a fanatic about her health. She died of cancer at the age of 32 with 3 small children left behind. The reason for this little story? There are two sides to everything and for as many people claim this is good for you or that is not,,,, there are just as many to claim the opposite. I should be able to determine what is good for me and what is not. Robin, I think your grandmother living to be 79 is awesome. I have known many young people who have passed in their 40s and 50s who did not grow up on a farm, did not have lard, raw milk, or ate off the land. Richard,,, I am not wrong for choosing what I choose to eat or drink,, but I will not say you are wrong either. It is a personal choice. I personally trust raw milk from a reliable source a lot more than I trust commercially produced milk from a big corporation that only sees dollars signs and does not care what king of hormones, antibiotics or other drugs they keep pushing into their animals to make them more productive or keep them alive in less than desirable conditions. Let’s be clear on the differences between homogenization and pasteurization. 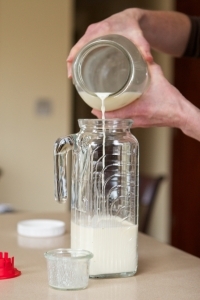 Pasteurization is what (supposedly) makes raw milk safe to drink. Pasteurization is the controlled heating of milk in order to kill certain pathogens in it. Homogenization has nothing to do with milk safety at all. Rather, homogenization is a process where the milk is repeatedly pumped under very high pressure and blasted into a spray for the purpose of breaking up the fat in order to keep the milk and cream from separating when it sits. Homogenization was a step added later on, after pasteurization, so milk would look nicer in the bottles. There are some studies that show that homogenized milk fat passes through arterial and cell walls better, causing homogenized milk fat to lead to more coronary artery disease. In either case, there is no reason to believe that homogenized milk is safer than non-homogenized. I thought id check-in before getting some sleep. And about the raw milk, its anyone’s choice to drink it and I’m sure it would taste great used in a egg cream. But if someone were to get sick from drinking it,well sometimes choices can have consequences. I could also walk in front of moving cars on a very busy highway, my choice that would be a yes, me actually doing it that would be a very big no. Ill leave the heroics to john Wayne and Hollywood. Richard from Penn. Stephen, you are so right about those differences and thanks for clarifying. Now the truly healthy thing to do is to drink pasturized skim milk … no worries about consuming the fat yet you still get all of the goodness of milk. It’s the product that I choose. We have home delivery in glass bottles. Milk comes from cows that are not subjected to hormones and steroids. Now, it’s time for all of us to have that bedtime glass of milk! Nite-nite!! Near my home is a dairy that has a sign outside that says “raw milk for sale”. Now its an older looking sign, and im not sure what the Laws are in the state of Pennsylvania regarding raw milk.Since i didnt know alot about the subject,only that it was not healthy to drink. So looked up little info up about it, and heres part of what i found. It’s like playing Russian roulette with your health,” says John Sheehan, director of the Food and Drug Adminstration’s Division of Dairy and Egg Safety. The dangers, he says, range from mild food poisoning to life-threatening illness. “One complication that can arise as a result of infection with E. coli O157:H7 is hemolytic uremic syndrome, which can cause acute renal failure, especially in the very young or the elderly,” Sheehan says. “There are absolutely no health benefits from consuming raw milk”. Im done commenting about this subject, and we still have the freedom of choice in America. Does it seem the is maybe becoming too much of a part of our lives, i feel the answer is yes.And speaking of choices, what can we Americans do about it. We can research who we put into office alittle better, i know ill be doing that myself. And knowledge is power, so ill be doing a better job trying to keep an eye on what my goverenment is doing, because i know they are watching me.And when it comes to election time “local and national”, i will be extra careful which lever that i pull.I think thats all anyone of us can really do. Richard from Lebanons Amish community. I drank raw milk on occasions and also consume raw milk products and I report zero health problems from this. I also consume brown eggs and eat produce that is grown without sprays, and that is all risky business according to the FDA. But what the FDA does not realize is people and other animals predate the FDA by thousands of years. And yes many of them lived to old age. Perhaps the reason for the increase in average age in our modern time has more to do with medical technology, medical science (surgeries),advancement in communication and transportation. These play a key role in the extension of the average life in the USA and not pasteurization of raw milk. Well who knew I have played Russian roulette for years and always win, or is the doctor picking words that will frighten and therefore discourage the use of raw milk in the public sector. I do not doubt that there are risk in raw milk consumption but I know far to many people that have used the product for a lifetime and never had a issue. Also many of the Amish can back me up on that point. If it were equal to playing Russian roulette a lot more issues would arise from raw milk consumption, and eventually all who consume raw milk would lose and fall victim to a harmful bacteria but this is not the case. I am not a conspiracy person. But sometimes when my observations vary from the information being put forth by a certain group then we may be right to question just how valid are said claims. Also pasteurization kills all bacteria and that includes healthy bacteria which is a loss in health benefits. So the director has made two statements that on simple grounds of logic can be easily defeated. Like I stated in another article there are many sides to a story and so it is with this story. As for my personal belief, I say the government should require RMP’s to improve and make stronger the warnings about raw milk and leave it at that, also the consumers need to accept responsibility to check out raw milk producers in terms of their safety precautions, and the special qualities of their milk. Alice and Tom I”m absolutely on your site of opinion. We don’t need government to choose for us we are capable to do that on our own, just don’t stay in our way. To rest who believe so much in government best doing for us just educate yourself a bit. Plus my granny to contrary of Robin’s or others drank raw and ate raw from farm almost everything and she past away being 97, living her live without any alignments whatsoever. Amen Richard! I’m with you 100%. And for those who chose to do so, drink that “raw” milk at your own risk. However, I shudder when I think of anyone giving it to a child. Okay, I’m done with this discussion … Erik, give us a new subject!! Thanks!! >meddling in what people eat. Mostly because folks died of acute illnesses before the chronic ones could kill them. It’s a two part problem — acute and chronic. I went to high school in one of the oldest upland settlments in New England (upland = away from the coast and major river valleys). 325th anniversary this year. Among the first generation of settlers, living to be 80, 90, and even centerians was relatively common. Amazing to look at the old headstones from the first half of the 18th century with such dates. First, they were an isolated community. There wasn’t much trade, and when people did travel with goods to or from coastal towns it might take two or three weeks to trundle away with a cart or driving animals — enough time for most acute diseases to sicken the person and either kill them or leave them quaratined in another town along the way. Second, being subsistence farmers the had exercise and a fairly low calorie diet. The calorie restricted diets seem to be the common factor in many populations around the world with long lives — they had a good diet, just not an excessive one. Maybe I’m in left field, but before you talk about organic/non-organic or chemicals on our food causing cancer…my gut says it’s more that were cramming so many calories and other nutrients into our bodies it’s causing the chronic illnesses. First, milk used to be drunk fresh or not at all. Items like butter (salting) and cheese (the process of making hard cheese removes the sugars bacteria feed on, leaving a pretty sterile environment for them) are fairly safe due to how they’re preserved. You didn’t have refrigeration or a need for it. Milk the cow, drink fresh, and what couldn’t be used on your table went to the pigs. So people — and calves — weren’t keeling over. You also had pretty direct reasons to watch your sanitation while milking, and anyone whose ever been in a dairy barn knows manure is constantly flinging around. Think about where the rear, the tail, and the udder are in relation to each other. Stuff splashes. When you started shipping to cities, and using ice / refrigeration to preserve the milk…it provided contamination time to grow. A few listeria cells in fresh milk you dunked your day old bread in at breakfast minutes after milking isn’t likely to do much. Give ’em time to multiply during shipping and storage, now you have a problem. So yes, pasteurization as the default is what we SHOULD have. The world has changed since 1630. Should we allow raw milk sales? Absolutely. Should we allow other-than on farm? That I’m not so sure, I guess a lot of people wouldn’t recognize a well run dairy if they saw one. But there is a big difference. Watching milking time at an ordinarily run dairy, you’d fully understand the need for pasteurization. They do spend a lot of time and money on sanitation…still, they’re not obsessively focused on it, which is what I would want from a raw milk supplier. At least visiting the farm and viewing the current milking parlor conditions you are making a truly informed decision. What I failed to add to by last post, those long lifespans declined to more ordinary ones by the middle of the 18th century, and the Revolutionary War with the much larger amount of travel & commerce occurring pretty much brought all the formerly isolated, rural areas down to the same life expetenancies, due primarily to acute illnesses, as the more settled areas. When you called for “Erik” Robin, I was almost ready to answer you. Since I actually became “Erik” during my comments about the united states government, I was still in character,lol. All I can say is its not easy being Erik and myself at the same time,………. I need a nap. Richard from Lebanon’s Amish community. That’s okay Richard/Erik … now, take that nap!! I think we’ve all beaten the raw milk subject to death! New subject please!!! I’ve already been a groundhog already, i thought why not be Erik Too. Have i already said how much i love my government. Can i get a big high-five for the government, I’m proud to say i love my government. On my next post, ill be sharing with you a love song that i wrote last night strangely enough about my love for the government. I became inspired while talking with an IRS agent a little earlier in the day, lets just say i might not be on in a long while. Now for that nap. Richard from Lebanon county’s Amish community. I believe that raw milk sales should be allowed…but I would not drink it myself. The diseases that can be present in raw milk may not be prevalent today, but they were back when people drank the fresh cow’s milk daily – those diseases could have been passed through the milk, from person to person, etc.. There was no way to know back then where it came from so we really don’t have a record, per se. My husband is a milk truck driver who picks up milk from farms, both regular and Amish. He occasionally has a drink of milk which has been stored in cooled tanks, fresh from the cows. He loves the taste. HOWEVER, it is only a small drink. Having worked in the dairy industry and on the farms, he says he would NEVER drink a large amount, or drink regularly, raw milk. He also never allowed our children, when they were younger and went with him on the truck, to have any of the fresh milk. While he would love to drink it regularly, there is just too great a risk of contamination on even the cleanest farms. If you’ve worked on one, you would know. Kerry that is a good point too, however. I think I know what you are talking about when you mention farm sanitation. I guess your husband doesn’t mind the occasional risk though, kind of like “Raw Milk Roulette” with a lot of chambers. IMHO, it is such a charged issue it is sometimes hard to know what info to go by. Kerry, your husband, like my late father, is a very wise man in the dairy industry. Risky business!! In case anyone would like further reading about raw milk, you can check out realmilk.com for good info. Milk only became dangerous after cows were moved off pasture and into inner-city feed lots where they were fed the waste products of the brewing industry in the early 20th century. The cows got sick, and so did the people drinking the milk. If you put all your trust in the FDA, realize that there is a revolving door between government employees and those working for big agribusiness. Just watch the end of the movie Food Inc. Finally, just for fun shock value, we (my husband & I and our one & three year olds) do indeed drink our raw milk fresh. We also let it sit out on the counter for a week, where it separates into curds and whey. Pasteurized milk goes rancid, while raw milk only sours, as in sourdough bread. We add salt and herbs to the curds and eat it as a spread. We use the whey to kick-start the process of fermenting old fashioned sauerkraut and other lacto fermented vegetables like kimchi. People used to do these things, but they have largely been forgotten. I think I want to go hang out with Naomi for a while…sounds like she does some cool things with food (though sadly, being LI I’d have to sit out on the cheese spread). First the war on drugs…now the war on raw milk! Sheesh, there went some tax dollars when this could have been solved on the cheap. Why not have a waiver, or a registry of some sort, where Jane/John Q Public can sign saying they understand the risks of raw milk, and they waive their right to whine and complain if they get ill? Lindsay, it seems like that would be sensible. I believe someone made the point on another post that there are a lot of other products that are potentially dangerous and even lethal that we are allowed to sell, consume, and/or use. Fireworks, energy drinks, butcher knives all come to mind. If there is a health risk, though, and people were made aware of that and chose to drink it anyway, it seems that at least the liability side would be taken care of. If people began getting ill and dying in significant numbers, then I think a lot more would think twice about drinking raw milk. But from the stats I’ve seen, it doesn’t seem like that has been the case. Unless there are unexplained hidden deaths and illnesses out there that we don’t hear about or connect with raw milk. Good to see that Naomi knows what she is talking about. I read through the entire string of comments, hoping to see if anyone would bring to light the real reason the FDA forced pasteurized milk on us. Erik you get credit as well when you mention sanitation. Robin, well you are just ringing the bell for the FDA’s cause with no practical experience of your own. You are the fireman’s wife proclaiming to be a fireman. When cows are kept on pasture and not in mud and given steroids and other medications they tend to be healthier. Hence less chance of disease such as mastitis etc. I have owned cows and drank their milk and made cheese. Lived on commercial dairies and seen thousands of gallons of milk trucked off everyday as a child. Milk produced both on pasture and on feed lots. I have seen the difference and tasted the difference. I will tell you that I would without hesitation purchase and consume raw milk from a reputable dairy that has their cows on pasture. I would also tell you that I would not purchase or consume raw milk from any dairy that does not have their cows on pasture. The use of medication and incidence of mastitis is too frequent to chance it. For me it is just this simple. A small pasture based producer that knows their herd. The facilities must be clean and the herd healthy. for that to all of us. Have a right to choose! One more example of the federal government interfering where it’s not wanted. Noone is forced to drink raw milk. Customers seek it out on their own. If the demand wasn’t there, the milk would not be being sold. It’s called the law of supply and demand, and it is one of the basics of economic theory that the United States economy is supposedly based on. Customers drink it at their own risk. Ok…a few things. The government does not exactly have our best interest at heart. They say we can legally smoke cigarettes that knowingly cause cancer. They just require a little label telling how bad they are. So, I can legally smoke as many damn cigarettes as I want and still get medical treatment for the cancer, lung problems, and many dangerous side effects, but I cannot go to my local SANITARY farm and buy a gallon of raw milk that contains the complete fats and proteins my that are good for my body? Ha! The FDA and the entire government have nothing but big dollar signs in their best interest. They can keep their processed foods and GMOs. I don’t want anything to do with it. My children eat organic and drink raw milk. They eat full fat yogurt, butter, and all dairy. They do not get sick. My 8 year old son goes to public school and he eats organic peanut butter and raw honey sandwiches every day. No flu, no colds, maybe a mild seasonal allergy from time to time. And to the person who mentioned Food, Inc…that movie changed my life. The entire damn government should be required to watch that one.